You can make a difference through a one-time or monthly donation, gifts of stock, creating an endowment or fund, or giving through your workplace. With any gift, you are welcomed into our Community of Stewards, and receive our biannual newsletter, The Scenic, monthly e-newsletter, and annual report. Whether your interests lie in education, environmental and resource protection, visitor facilities or cultural heritage, the Blue Ridge Parkway Foundation can match your donation with the projects and programs that reflect your vision for the Parkway. By naming the Blue Ridge Parkway Foundation as a beneficiary of your IRA, a life insurance policy, or in your will, you create an enduring legacy that protects this special place for generations to come. With a planned gift, you become a member of The André Michaux Society, which honors the French botanist and explorer who enlightened others about the natural wonders of our mountains. Members receive a personalized certificate recognizing their dedication to the Blue Ridge Parkway. For more information, e-mail Ashley Edwards or call (866) 308-2773, ext. 170. Contact Ashley Edwards at (866) 308-2773, ext. 170, or e-mail her to notify us of your intention to make a stock gift. Please include your name, the name and amount of the shares being transferred, the expected date of the transfer, and the purpose for which the gift is to be used. Failure to notify us with donor details could result in filing the stock gift as anonymous. With proper notification, receipt letters to donors will indicate the number and types of shares, date of the transfer, and value of the gift. For valuation purposes, the donor of publicly traded stock will be credited with the fair market value of the stock which is determined by averaging high and low trading prices on the date of the gift. By establishing an endowment fund, you create a permanent legacy of support to meet the ongoing needs of the Blue Ridge Parkway. For more information, e-mail Ashley Edwards or call (866) 308-2773, ext. 170. 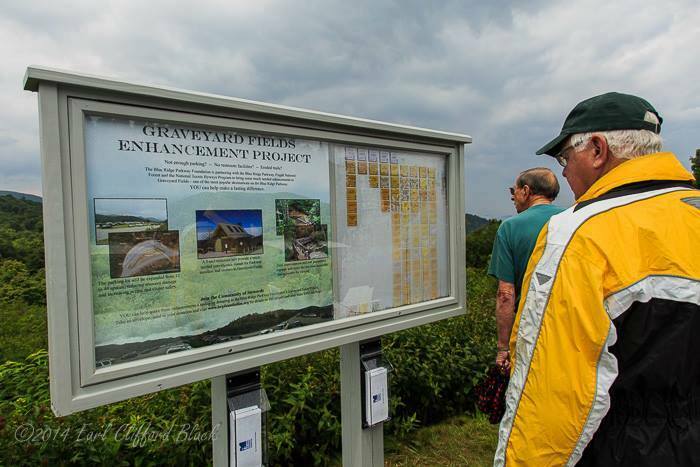 The honor and memorial program is a thoughtful way to celebrate loved ones and friends who have enjoyed a deep personal connection with the Blue Ridge Parkway. Honor and memorial gifts can be made online or with our mail-in form. You will receive an acknowledgement of the gift, and can select an individual to receive a card announcing the donation. Many employers acknowledge their employee’s generosity by providing matching donations. Check with your company’s human resources representative for details. Employees of businesses that participate in EarthShare’s Workplace Giving, the Combined Federal Campaign, and State Employee Giving Campaign, and others can designate their contributions for the Blue Ridge Parkway Foundation. Many of our projects focus on long-term renewal efforts along the Blue Ridge Parkway. You’ll find displays recognizing the donors who have given $100 or more in support of these important projects at the following locations. When you shop at Amazon.com you can designate that a portion of proceeds from your purchases goes to the Blue Ridge Parkway Foundation. Signing up is easy: visit smile.amazon.com. If you already have an Amazon.com account, you'll be prompted to log in; if not, you'll be asked to create an account. On your first visit to AmazonSmile, you'll be asked to choose a charitable organization to receive donations. Simply select the Blue Ridge Parkway Foundation, and every eligible purchase you make will help fund crucial initiatives. Make a donation to support the highest priority needs on the Parkway. Your one-time or monthly tax-deductible contribution will help preserve this magnificent national park unit and further the work the Foundation does to support it. No matter how you choose to give, we thank you for helping to preserve and protect the Blue Ridge Parkway!